_A native of Buenos Aires, Argentina, Melina Moore grew up in New York City and received her undergraduate training at The Juilliard School in voice and piano accompaniment, beginning at age 16. Prior to that, her vocal and performance study began at the age of 9 at the Manhattan School of Music Preparatory Division with Donald Read, and she was a member of the New York City Opera Children's Chorus and the Metropolitan Opera Children's Chorale, debuting in Boito's Mefistofele with Samuel Ramey. A vocal performance major at the Fiorello H. LaGuardia High School of Music & Art, Melina made her operatic debut as Susanna in The Marriage of Figaro with LaGuardia's Bel Aria Opera Company in 1995, under the tutelage of her first vocal instructor, Anna Ext. Among the honors she has received are a full academic scholarship to Columbia University, a tuition scholarship to the Juilliard School of Music and the Lucrezia Bori Grant for operatic and interpretive study and performance at the Teatro Colon in Buenos Aires, Argentina. A versatile high-lyric coloratura, Melina participated in a four-year Bachelor Degree program at the Juilliard School where she trained under Beverley Peck-Johnson and Cynthia Hoffmann, and appeared as a soloist in the Alice Tully Hall opera concert series, the Juilliard Opera Center and the Maxwell von Gluck Fellowship, studying and performing the roles of Belinda in Dido and Aeneus, Celidora in L'Oca del Cairo, Despina in Cosi Fan Tutte, Gretel in Hansel and Gretel, Adele in Die Fledermaus, Oscar in Un Ballo in Maschera and Nanetta in Falstaff. With the Mannes College of Music, she performed the role of Zerlina in Don Giovanni, and Papagena in The Magic Flute with the Teatro Colon Y.A. Program in Argentina. She has been an active recitalist in and around the New York area, and since her move west, has continued to appear in concert in British Columbia, Alberta and Ontario. With a love of musical theatre, Broadway and off-Broadway productions in which she has appeared as a principal artist include Good News, Showboat, The Apple Tree, Fiddler on the Roof, Guys & Dolls, My Fair Lady, The Music Man, Annie Get Your Gun, Beauty and the Beast, Carousel, Candide and The Sound of Music. _Melina's work in Canada has included The Queen of the Night in The Magic Flute, Gretel in Hansel & Gretel, and Susanna in Le Nozze di Figaro, all with the Okanagan Vocal Arts Festival. Concert and oratorio works have included The Faure Requiem, Handel's Messiah, Schubert Mass in B Minor, John Rutter's Requiem and Carmina Burana, with the Prince George, Kamloops and Kelowna Symphonies, and, most recently, a tribute to Andrew Lloyd Webber with the OSO. She has performed with the Burnaby Symphony, Kelowna Canada Day Symphony Orchestra, Prince George Symphony, Symphony of the Kootenays, Kamloops Symphony and Okanagan Symphony Orchestra, and has been a featured artist on CBC Radio Two. In July 2011, Melina completed a successful tour as soprano soloist with the Victoria Summer Symphony and Choir with conductor Simon Leung, and featured as soprano soloist in Mozart's Requiem with the OSO in November. Raised in the Jewish faith, Melina has been a cantorial soloist for Temple Beth Shalom in Manhattan, and The Okanagan Jewish Community Centre in Kelowna, BC. She has just completed a CD entitled Songs for my Zeide featuring original arrangements of Hebrew, Yiddish and Russian folksongs, accompanying herself on piano. From 2007-2009, Melina produced and starred in Opera with a Twist, an original production bringing opera to the masses, completing two tours of Western Canada to great acclaim. Since 2010, Melina has been the headline performer at the new Swarovski Sparkling Hill Wellness Resort, performing as soloist in her original concert series, Soprano on the Hill, to Canadian, American and European audiences. Since 1996, she has been the founder and director of the Valley Vocal Arts Studio in Vernon, British Columbia. Acting as producer and musical director for aspiring singers of all ages, Valley Vocal Arts has enjoyed acclaimed full-scale productions of Les Miserables (2010), Mel Brooks' The Producers (2011) and the upcoming Pirates of Penzance (2012). She is passionate about bringing the best of live theatre and showcasing local talent to Okanagan audiences. Their rise to international noteriety has been a roller coaster; after less than a month of 'jamming' together in the BRfm radio station, Just Harrie were fortunate enough to be asked to join West End musical theatre star Peter Karrie and musical director John Quirk on their UK wide tour throughout 2010. Later that same year they were then asked to perform for 'Sony's' official Christmas party, to great acclaim. Just Harrie will soon resume their touring performances, both solo and together with Peter Karrie, and will also continue their support of charities including Bobath Cymru, In the Pink and others. 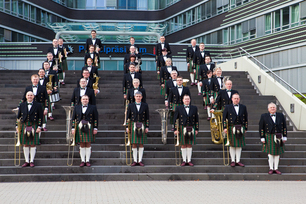 In 2012 the group look forward to returning to Switzerland and the Basel Tattoo, and to Crete for the Crete International Festival of Arts. 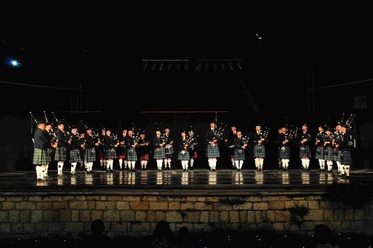 In recent years musicians from the group have toured to Canada, Germany, Greece and North Africa, and featured in some of the world's largest ceremonial events including the Crete International Tattoo, the Hamburg Polizei Show, the Mediterranean International Festival of Arts, the Royal Nova Scotia International Tattoo and the World Military Music Festival. _Club Piruett is a gymnastics school based in the Estonian capital of Tallinn. The club was founded in 1990 and is a member of the Estonian Sports Association "Kalev". Club Piruett currently has more than 600 members, the youngest of whom are as young as 3 years of age. The club has become a centre for various gymnastic activities for children and different styles of workout for women. Club Piruett boasts a first class team of highly educated and experienced coaches, whose strong and goal oriented work with competitive groups sees Piruett consistently among the best clubs in Estonia. Club Piruett's internationally best known performing group is the Club Piruett Elite group. The Elite group consists of about 20 gymnasts, and the members of the team are in age between 12 to 25 years. Their programs are a mixture of rhythmic gymnastics with apparatuses, dance and ballet. During the 10 years since their formation the Elite group has participated in many international sport and culture events. They have been invited to Kiel's Week on several occasions, which is the group's success actually began. In addition to that the Elite group has participated in international festivals in Japan, Canada, Denmark, Sweden, Belgium, Portugal, Finland, Germany and many other countries. Anywhere and everywhere, a community is recognised through certain symbols. Badges, standards and flags are part of these symbols, which become a source of pride and unity among people. 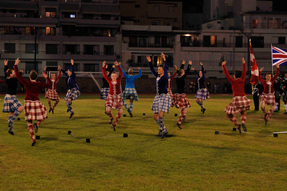 In periods of peace, the standard-bearers would meet in order to develop and improve their techniques, and over time, greater emphasis was given to perfecting the routines and the spectacle. And it was thus that the flag wavers came to be. 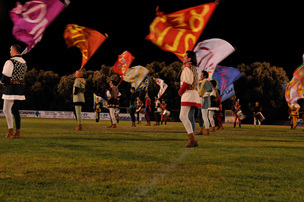 The Sansepolcro Flag-Wavers, were the first group to be formed in Italy and are still the oldest of all groups involved similar activities. Made up of flag-wavers, drummers and trumpeters, the group uses hand-painted flags and wears costumes made by professional theatrical costumiers.